The top 50 picks of the MLB Draft are in the books and there’s still plenty of big names available. Here’s a quick list of some of the names you can expect to see come off the board early on day two. 1. Stetson Allie – RHP – St. Edward HS (OH). The 6’4″ 225 fireballer hit 101 MPH over the weekend while leading his team to a state championship. Rated as the #8 player in the draft by Baseball America, I suspect the Allie camp threw out a high number that has scared some teams away. University of North Carolina Head Coach Mike Fox is hoping his slide continues, as it increases the likelihood he ends up at Chapel Hill. 2. Austin Wilson – OF – Harvard-Westlake HS (CA). At 6’4″ 215, he’s a bag of tools that has yet to put them all together in game action. He’s going to be extremely difficult to sign away from Stanford, especially this late. 3. Brett Eibner – RHP/OF – Arkansas. Most teams want him as a pitcher, he likes hitting and blasted 3 HR in the opening game of regional tournament last weekend. 4. A.J. Cole – RHP – Oviedo HS (FL). 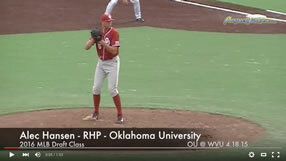 At 6’5 190, he fits the mold for the prototypical projectable prep pitcher. He’s headed to Miami (FL) if he doesn’t sign. 5. Brandon Workman – RHP – Texas. The #3 pitcher on the best college pitching staff in years. Could be the first guy on this list to go in Round 2. 6. Jesse Hahn – RHP – Virginia Tech. H.S. teammate of new Mets draftee Matt Harvey. Possible future MLB closer. 7. Yordy Cabrera – SS/RHP – Lakeland (FL). 19 year old at 6’3″ 200 has plus power and a plus arm but few think he’ll stick at SS. 8. Chad Bettis – RHP – Texas Tech. Possible destination would be the White Sox in round 2. 9. Ryan LaMarre – OF – Michigan. Athletic OF who will attempt to play CF as a professional. 10. Jarrett Parker – OF – Virginia. One of the better athletes left in the draft.